Latest and historical treasure hunting, metal detecting and archaeology news and finds. 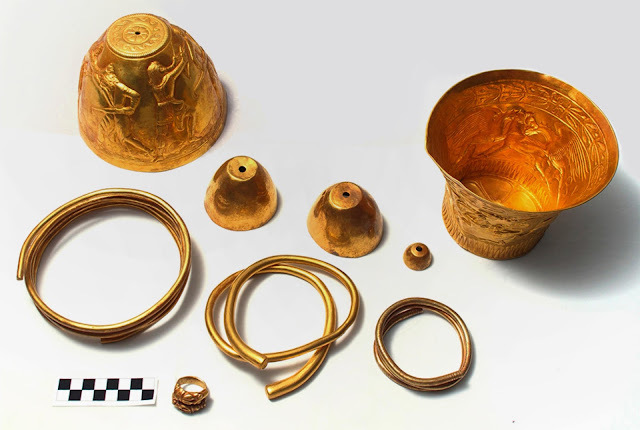 The Scythians were Eurasian nomads, who traveled the continental landmass of Europe and Asia from about 9th century BC up until the 4th century ADThey were known as great horsemen, warriors, and invaders, therefore portrayed as such on artifacts discovered throughout time, an example of which is a gold comb, dating to the late 5th to earth 4th century B.C found in a royal tomb of Solokha, Eastern Ukraine. Separate tribes spoke the same language and were united in some ways, but not believed to be governed by one body. Historic finds reveal that separate tribes had, for example, differences in their artistic expression as well as burial practices. They also had no written language. Being constantly on the move left no traces of settlement. Most of what we know today about them are from writings of other cultures of which the main source is the Greeks. The word Scythian was first used by the Greek historian Herodotus. Oak Island, located at the south shore of Nova Scotia, Canada, has a history of attracting treasure hunters since 1875. The first person to search the island was 18 year old Daniel McGinnis with help of some friends, their efforts piqued serious curiosity. After digging a few feet down they found a layer of flagstone and the pit walls have pick markings on it. Every ten feet (3 m) they dug, there was a layer of logs. 30 feet later, their manual excavation attempts became too difficult. Rumors of a "money pit" treasure have been circulating due to the known fact that pirates came ashore at times in the distant past. A lot of attempts have been made over the years to dig deep enough to confirm the existence of a treasure on the spot, but alas, as a result of too much flooding, it has not been possible.